Are you Making these 10 Healthy Eating Mistakes? Did you know that you could be sabotaging your own health by not just what you eat, but when and how you do it? This post discusses 10 of the most common mistakes we make when taking our meals. 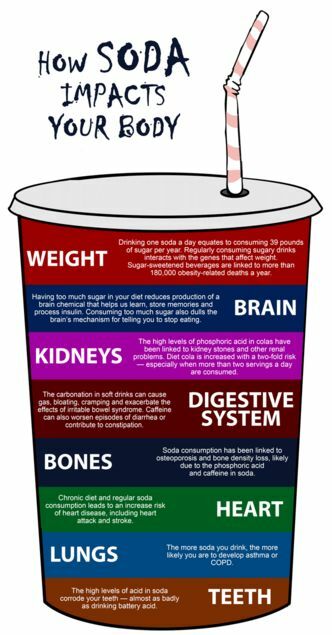 Carbonated drinks and especially soda are very bad for your health. In the infographic below by True Health, you can see its impact to different parts of the body. Take small bites and chew your food at least 13 times before taking the next bite. This allows the stomach to fill up faster without having to eat so much food. Taking water before eating tricks the body into thinking that you are not so hungry thus reducing the possibility of overeating. Listen to your body as you eat and leave your plate immediately you’ve had enough. Avoid taking more food than required. Breakfast is important as it maintains the optimal metabolism which when lowered can actually result to increased weight gain. A high metabolic rate will also increase your rate of shedding the weight thus working to your advantage. White sugar, salt and flour are not good for your health and their intakes should be minimized as much as possible. Instead of taking saturated fats, take unsaturated ones from oily fish, avocados, nuts and vegetables. Take oily fish at least twice in a week. Make sure you eat you eat fruits and vegetables with each meal to ensure that you are getting the recommended amount of vitamins and minerals daily. Greens are rich in calcium, magnesium, iron vitamins A,C,E, and K,, zinc and potassium. They hel;p strengthen the blood and respiratory systems. Fruits on the other hand provide fiber, vitamins and antioxidants that help in fighting cancer. The importance of water can never be over emphasized. It helps in supplying the body with oxygen, removing the toxins from the body as well as playing a major role in digestion.